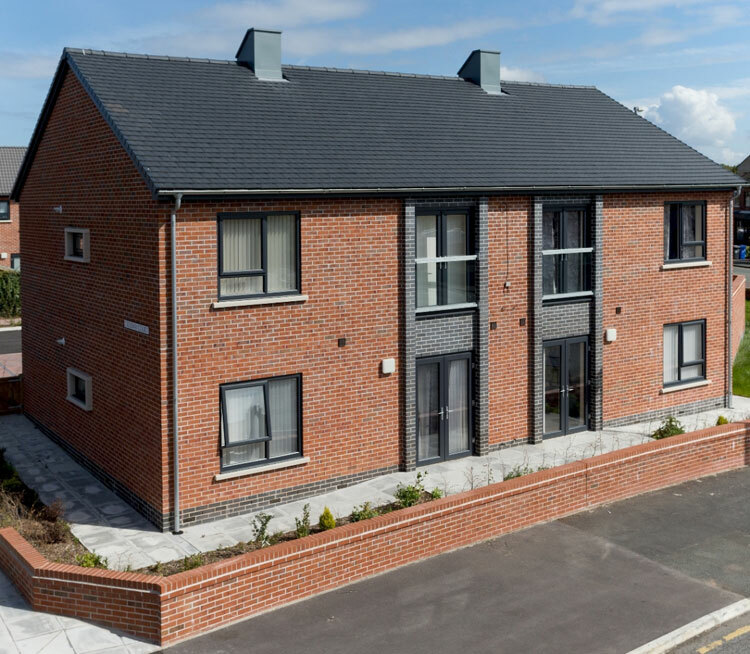 The award-winning Crossway development in Widnes, Merseyside employs the revolutionary Innofix Clip developed by Redland – the UK’s leading manufacturer and supplier of pitched roof systems – and two of its tiles to achieve a weatherproof envelope in the shortest time possible. 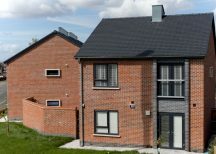 Designed by Denovo Design of Liverpool for the Halton Housing Trust, the small estate was a winner at the 2017 Green Apple Awards for the Built Environment and Architectural Heritage, and also a finalist in the LABC (Local Authority Building Control) NW Awards, in two categories, Best Social or Affordable New Housing Development and ‘Best Small New Housing Development. 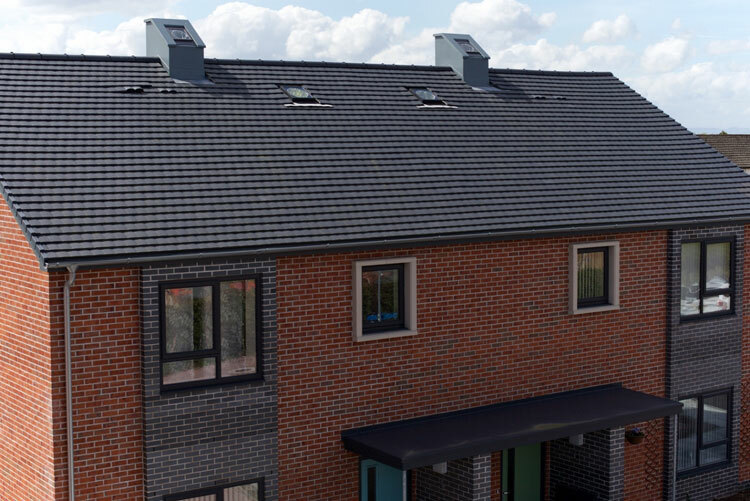 There are 12 plots on the site, in a mixed development of two bungalows, four three-bed houses and six one-bed apartments, all roofed in Redland Grovebury double pantiles in colour Slate Grey and Redland DuoPlain interlocking plain tiles in colour Blue to blend in with the surrounding area. “Quality and durability are important and Redland is a tried and tested manufacturer so it has credibility with clients such as housing associations for whom maintenance is a big issue”. 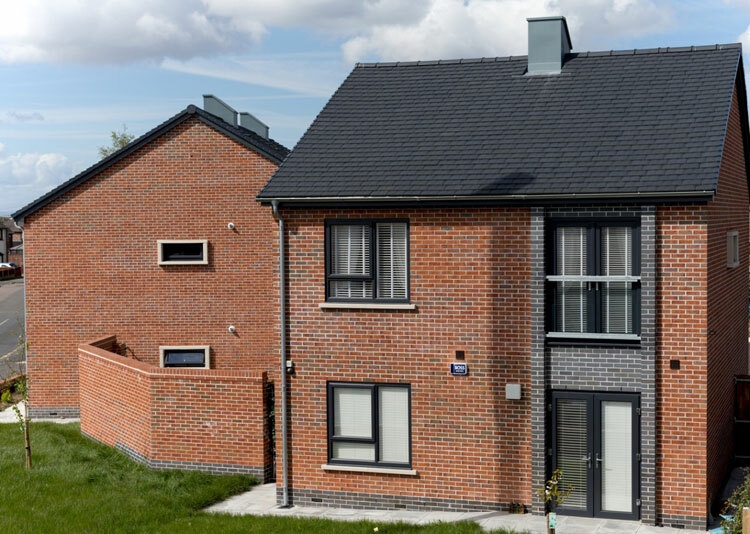 “We chose these two specific tiles to meet concerns from the planning department and the Innofix Clip was a definite benefit because all these buildings are timber-frame, so it’s imperative to get them weatherproof as soon as possible”. “This was the first time that we’ve used it and it worked really well, so well that we’re going to use it on our other jobs when we can”. Developed for the entire range of Redland’s concrete interlocking tiles, the Innofix Clip needs no tools at all and meets the increased fixing requirements set out in BS 5534, the British Standard Code of Practice for Slating and Tiling. The only tile clip that needs no hammer, Innofix is the fastest and easiest fixing on the market and up to 40% quicker than using traditional nailed clips. They come ready to use in a unique magazine-style holder ensuring they are tangle-free and can be easily removed from the packaging with one hand. DuoPlain tiles are laid ‘single lap’ but look as if they are classic ‘double lap’, and only use one-third as many tiles because each interlocking tile has a mock central groove and distinctive double camber tile segments. This makes each tile look like two traditional plain tiles so you can cover the same area with fewer tiles. This cuts costs because installation is quicker, creates less waste and also reduces roof weight. With pitch performance down to 250, DuoPlain tiles create new design possibilities without compromising their traditional plain tile appearance. 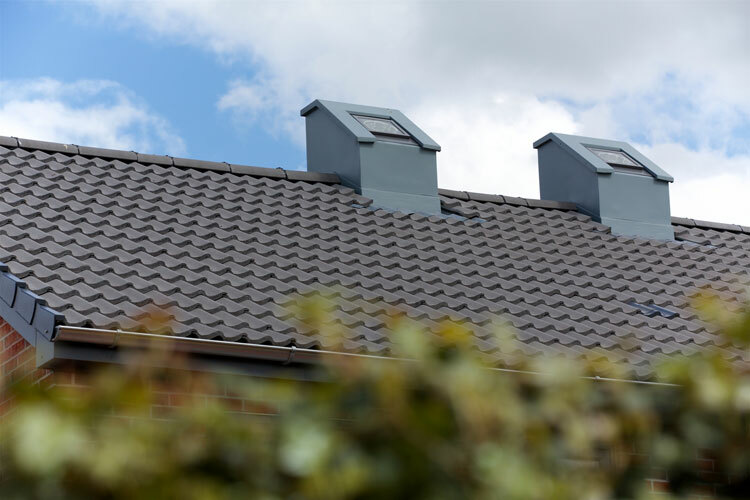 To complete the traditional plain tile look, DuoPlain tiles come in seven different colours and with a comprehensive range of ridge, hip and verge systems, vent tiles and fixings – all guaranteed to remain secure and weathertight for at least 15 years. Based on the same arithmetic – a double pantile shape is quicker and easier to lay than a single pantile design – the Grovebury concrete interlocking tile retains the traditional flowing lines of a classic pantile to blend easily and harmoniously into any environment. 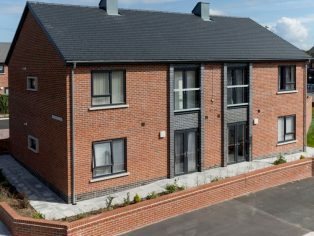 A low pitch, wide variety of colours, and two different surface textures to choose from makes Grovebury a popular choice for both new build and renovation.